The worm might usually be reserved for early risers but even night owls have a chance to bag themselves a wriggly treat thanks to this fun casino game from Eyecon. Inspired by the highly successful Worms series of slots by Team17, this squirmy new online slots game is sure to put a smile on your face. The background depicts a luscious green field, with the sun poised to rise in the background. The cute little bird flaps his wings and looks around in eager anticipation as he keeps an eye out for his breakfast. Meanwhile, you’ll be keeping your eyes on the reels of this Online slot games, looking out for the elusive but incredibly cute little worm symbol, who tries his best to stay hidden! Find him amongst the other symbols which include watering cans, flowers, a fluttering bird, and brightly coloured numbers and letters. Eyecon Pty Ltd. is an Australian based company and a well-established veteran in the gaming industry. They have been producing popular slots since 1997. They have over 100 slots in their portfolio, but their expertise is in land-based gaming rather than online casinos. Accordingly, you are unlikely to find cutting edge technology or jaw dropping graphics in their slots. However, Gets the Worm includes some fun in-play features such as the gamble round which will have you on the edge of your seat! If you love promo's, check SlotsBaby today. This is a straightforward 5 reel, 25 payline video slot that is very user friendly. It is styled to look like a garden in early morning, and so players can expect to see symbols such as flowers, watering cans, and bird houses scrolling past on the reels. The Wild symbol in this game is the ‘Gets the Worm’ logo. If you can match 5 of these along an active payline you will bag yourself the game’s maximum jackpot – a whopping 20,000 credits! The Scatter is of course the sweet little worm character. 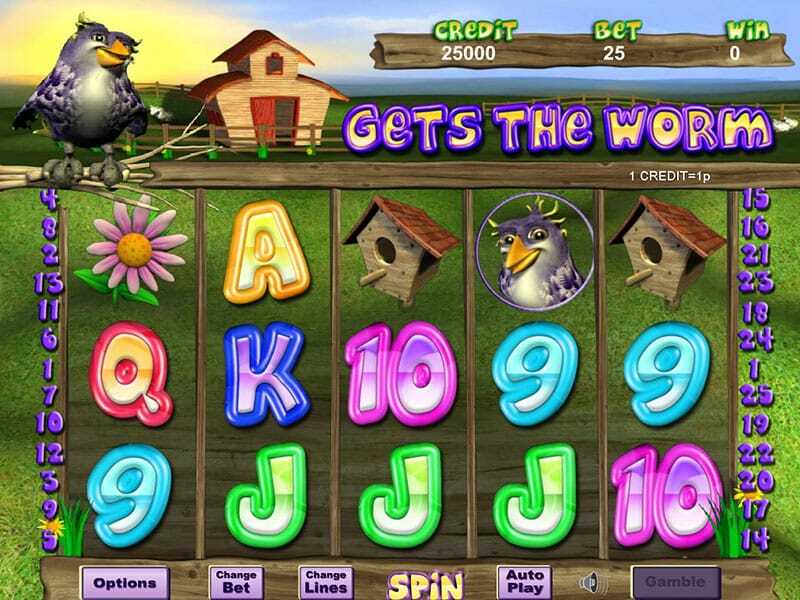 If he wriggles into a line of 3, 4, or 5 you will be awarded with several free spins. Adrenaline junkies will enjoy the added excitement of a Gamble feature at the end of each round, where you have the option to grow your winnings in a double or nothing situation. You can take this gamble up to 5x in a row if you are feeling particularly lucky! I never thought worms could be cute but these goofy little characters are just adorable! The simple yet cheerful design of this video slot from Eyecon is at the heart of its appeal. The gamble feature is a fun bonus that adds a dimension of risk and excitement for those who want it, so it will appeal to a broad range of players. As with most Eyecon slots, players looking to be wowed by pioneering graphics and innovative new features will likely be underwhelmed. However the game makes up for this with its charming lead characters and high levels of fun!